Glute Imbalances are much more common than most people assume. For example, I’m currently training twelve different clients; ten women and two men. Out of these twelve lifters, four possess glute imbalances in varying degrees (all of them are women). Two of them seem to have gotten worse through my training, indicating that I wasn’t paying close enough attention to symmetrical movement as the months progressed. Glute imbalances rear their ugly heads most often during the squat exercise. When maxing out or repping out to failure, the hips will start shifting toward the stronger side (away from the weaker side). This is undesirable from both functional and aesthetics standpoints, so you want to nip it in the bud as quickly as possible. How Do I Know if I Have a Glute Imbalance? Let’s get back to my clients. One of them took a month lay-off over the holidays and upon returning she now feels a big difference in activation between glutes. She perceives that her right side is firing much harder than her left side during movement and also isometrically from different positions. I palpated her glutes and confirmed that there was indeed a discrepancy; the right side would achieve greater density compared to the left. 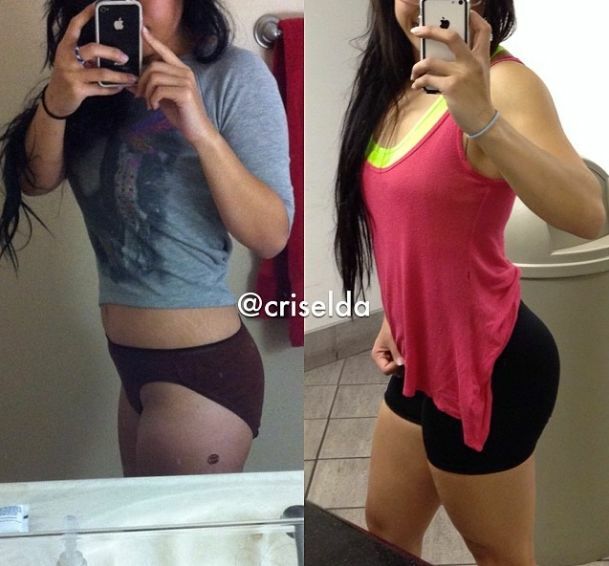 Another started shifting to the right considerably when she squatted. This client is also sporadic in training, which tells me that glute imbalances tend to crop up when clients take time off from lifting. I also noticed when the client was performing reverse hypers that one side was visually larger than the other side when contracted. At the top of the movement, I could clearly see that the right glute was more muscular and rose to a greater degree during contraction compared to the left side. Here is what I’ve come up with lately to help fix this issue. I like to set the step up height so that the thigh of the top leg is parallel to the ground when the toe of the bottom leg comes off the ground. 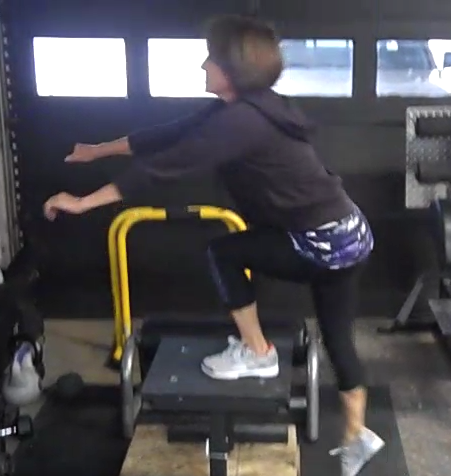 Here’s a video of Mary performing a set of single leg hip thrusts with her right leg. To reiterate, to use the 2-1 method, you perform one set with the weaker leg, followed by one set with the stronger leg, followed by one set with the weaker leg. Take 30-60 seconds of rest between legs. I have my clients do their normal workouts (except squats aren’t taken to failure for reasons discussed below), and then at the end of the session they will do two additional exercises with the 2-1 technique (usually high step ups and single leg hip thrusts). When trying to fix a glute imbalance, stop your squat sets shy of failure. You’ll find that you’ll likely be able to perform the first several repetitions of a set with great symmetry, but as you get closer to momentary muscular failure, your form will erode and you’ll start shifting your hips laterally. Every rep you perform this way reinforces bad technique, so don’t go there. Stop the set prior to this occurrence so you groove sound mechanics. In just three sessions of using the 2-1 technique, I’ve already seen improvements in my clients’ symmetry during squats. Beginning with the weaker leg ensures that it receives the stronger training stimulus, and the extra volume for the weaker leg adds up over time. Make sure you read the other articles on glute imbalances though, as there are other things you can be doing to fix glute imbalances. The post The 2-1 Method for Fixing Glute Imbalances appeared first on Bret Contreras.